On Wednesday 26 April, St Patrick’s College Anzac Day Ceremony was held in the College Gymnasium. Staff and students commemorated the contributions of hundreds of thousands of Australian and New Zealand servicemen and women over the past century. The occasional address was delivered by Vietnam Veteran Gordon Malcolm who provided a highly poignant account of his experiences in Vietnam and in the decades which have followed. 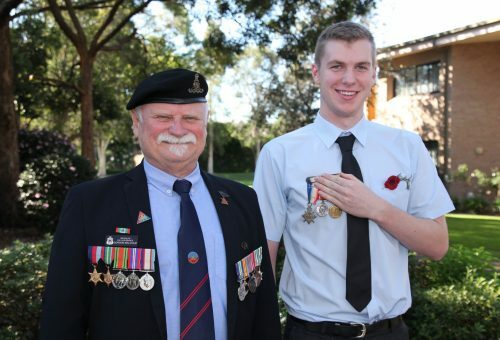 The reading of the names of the fallen SPC Old Boys was orated by Mr Steve Fochesato, College Captain Matthew Harrington recited the Ode For the Fallen and the Last Post and Reveille was played by Year 11 student Zac Saric. In addition, a minute’s silence was observed by all and a wreath was laid in front of Br ‘Digger’ Crichton’s portrait and the service medals of students Callum and Nicholas McKenzie’s great great grandfather and great grandfather who served in WWI and WWII respectively.